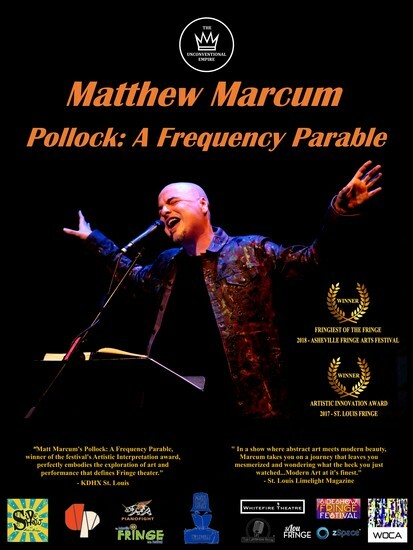 Matthew Marcum, Artistic Director and co-founder of The Unconventional Empire, explodes onto the stage using a combination of dialogue, music and experimental sound to explore the world of modern art paying homage to rock star expressionist-icon, Jackson Pollock. After premiering at The New Experimental Works Festival in San Francisco, CA this piece has continued to pick up steam across the country, appearing at the St. Louis Fringe Festival, where it received the Artistic Innovation award, The Asheville Fringe Arts Festival, where it received the Fringiest of the Fringe Award, and most recently made it’s Los Angeles premier as part of the Whitefire Solofest. Matthew Marcum Pollock: A Frequency Parable is an avant-operatic sound performance piece that explores elements of abstract expressionism through nonlinear narrative and extended vocal techniques. By re-conceptualizing key elements used in this revolutionary style of art making such as energy, motion, scale, and improvisation, a challenge is presented to both the performer and the audience to free the voice from the confines of form and language allowing it to transcend tradition and be experienced for it’s potential – Modern Art. The creator of this piece, Matthew Marcum, is an interdisciplinary performance artist that infuses text, sound, movement, and optics to create contemporary theatre productions, live art exhibitions, and conceptual installations. Mixing vocal prowess and fierce intellect Marcum’s work is both innovative and captivating giving new definition to what it means to be an “expressionist”. ​This piece has a run time of 20 minutes and includes music, video projection, and theatrical lighting. Content is appropriate for all audiences.